Bees are having a much harder time finding food in the region known as America's last honeybee refuge, a new federal study found. 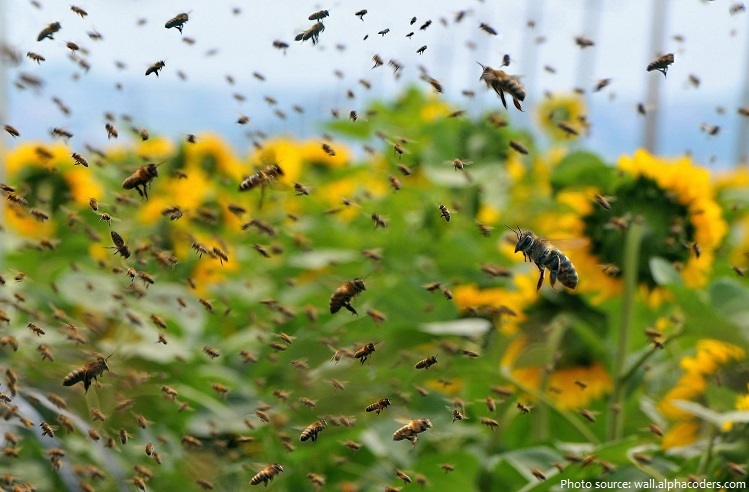 The country's hot spot for commercial beekeeping is the Northern Great Plains of the Dakotas and neighboring areas, where more 1 million colonies spend their summer feasting on pollen and nectar from nearby wildflowers and other plants. But from 2006 to 2016, more than half the conservation land within a mile of bee colonies was converted into agriculture, usually row crops such as soybeans and corn, said the study's lead author Clint Otto of the U.S. Geological Survey. Those crops hold no food for bees. For more than a decade, bees and other pollinators in America have been dwindling in numbers because of a variety of problems, including poor nutrition, pesticides, parasites and disease. And outside experts said this study highlights another problem that affects the health of bees. This area - which Otto called "America's last honeybee refuge" - lost about 629 square miles (1,630 square kilometers) of prime bee habitat, according to the study published Monday in the Proceedings of the National Academy of Sciences. And bees that have a hard time finding food are less likely to survive the winter, Otto said. They may not be hungry, he said, but they aren't healthy either. John Miller, in his 49th year as a North Dakota commercial beekeeper, said the Dakotas and Minnesota were once the last best place for bees. "Now they are the least worst," he said. Miller, whose business was started in 1894 by his great-grandfather, has watched the average colony honey production drop from 120 pounds per hive 30 years ago to about 50 pounds now. But the price has gone up five-fold, and beekeepers like Miller are getting paid to truck their bees to California to pollinate crops there, mostly almonds. The federal government pays farmers to keep some land wild and that benefits bees that feast on grasslands, flowers and weeds, Otto said. But the conservation program has a cap on how much land it will pay for - and during the ethanol boom, farmers found they could make more money in corn and soybeans. "Commercial beekeepers are scrambling to try to find places to take their bees when they are not in a crop requiring pollination," U.S. Department of Agriculture bee researcher Diana Cox-Foster, who was not part of the study, said in an email. "The conservation lands of the Northern Great Plains were a go-to spot," she wrote. More than one-third of America's commercial colonies spend summer in the Northern Great Plains. The area east of the Dakotas is too developed, and the weather to the west is too dry, Otto said. Bees are crucial pollinators for more than 90 percent of the nation's flowering crops, including apples, nuts, avocados, broccoli, peaches, blueberries and cherries. "Without honeybees," Otto said, "our dinner plate looks a lot less colorful."